In the same arena as the Hadouken tattoo, here’s another geeky head tattoo. I’ll be honest, I’m not familiar with Warhammer Fantasy but I know some players out there certainly are. 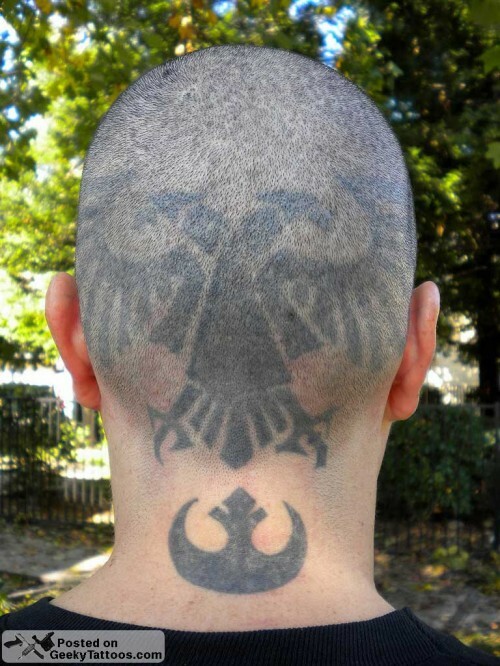 Great White Snark, one of my favorite sources of geek tattoos, pointed out Jude here who has gone and tattooed the Imperial Eagle on his noggin. That’s true dedication kids. You can check out more photos of Jude’s head ink as well as his other Warhammer tattoos on Warhammer dedicated blog. Tagged with head, Jude, Rebel Alliance, RPG, Star Wars, Warhammer. Shucks. You say the nicest things. Better yet, you post the best tattoos. That's 40K, not Fantasy :P But it is an awesome tattoo! I'm planning on getting a Chaos Space Marine one!